Gary Earl Johnson (born January 1, 1953) is an American businessman, author, and politician. He was the 29th Governor of New Mexico from 1995 to 2003 as a member of the Republican Party. He was also the Libertarian Party nominee for President of the United States in the 2012 and 2016 elections. Johnson founded one of New Mexico's largest construction companies. He entered politics for the first time by running for Governor of New Mexico in 1994 on a low-tax, anti-crime platform, promising a 'common sense business approach'. He beat incumbent Democratic governor Bruce King by 50% to 40%. He cut the 10% annual growth in the budget, in part due to his use of the gubernatorial veto 200 times during his first six months. 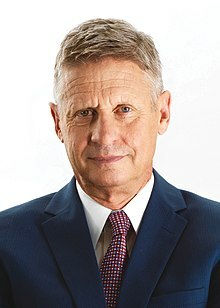 Johnson ran for president in 2012, initially as a Republican on a libertarian platform emphasizing the United States public debt and a balanced budget, protection of civil liberties, military non-interventionism, replacement of income tax with the FairTax, and opposition to the War on Drugs. In December 2011, he withdrew his candidacy for the Republican nomination and stood for the Libertarian nomination instead, winning the nomination in May 2012. Johnson received 1.3 million votes (0.99%), more than all other minor candidates combined. Johnson ran again in 2016, winning the Libertarian nomination and naming former Republican Governor of Massachusetts William Weld as his running mate. Johnson received 4.4 million votes (roughly 3.3% of the total vote), which is most for a third party presidential candidate since 1996 and the highest national vote share for a Libertarian nominee in history. Since the 2016 presidential election, Johnson has stated he will not run for public office again.